Actual handling and shipping expenses are additional and can range from $100 to $250, depending on how fast a shipment is needed. Tanzeln is a lovely stallion with three excellent, well balanced gaits. He received a 9 on both his walk and his canter (most important for a dressage career) and an 8 on his trot from the ATA Inspection Committee. His temperament is excellent and he has a wonderful work ethic. 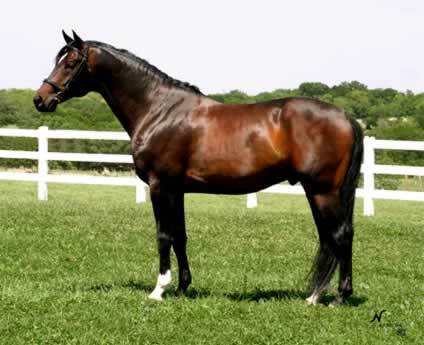 Tanz's sire, Enrico Caruso *Ps*E* is one of the top Dressage producing stallions in Germany and sired the well-known Trakehner stallion Kostolony. Tanzeln's dam line is that of Dankeschön III, known for producing significant stallions, with a strong foundation, great lines and impulsion in all gaits -- this is the family of Schöner Abend, Schwarzdorn and Tannenberg. Having completed his performance requirements, Tanzeln trained and showed through 2nd level dressage until an injury forced his retirement from competition at age 7..He has since been rehabbed (see article on right under photos) and is currently competing at FEI dressage. Tanzeln's offspring are excelling in multiple disciplines. He has several offspring now competing in dressage up to Prix St. Georges. His 2005 filly Kiera took an 81.5% and reserve championship at her very first in-hand show (at 8 months old). She went on to win multiple in-hand championships, materiale and training level classes with scores to 80%. She placed 5th in USDF 4 yr old materiale and won the Region 9 Open Training Level Championship. She has her sire's wonderful work ethic, a loving disposition and great gaits and is now showing PSG. Other offspring are also exceling in dressage, eventing and jumpers. Many blue ribbons and many happy owners! Tanzeln *Ps* has an amazing story and much to thank Iris Eppinger (dressage trainer and acupuncture, acupressure and natural equine medicine practitioner) for. After his promising dressage and eventing career was cut short at 7 years old by a mysterious lameness, a complete bone scan showed a possible broken hip and we retired him. 3 years later, Tanz was so unhappy to not be working that we agreed to let Iris and Valhalla Farm take a chance and see if they couldn't rehabilitate him for at least light riding. Iris has exceeded everyone's hopes, bringing Tanz back to where he is now showing I-1 with Bryana Smith, his amateur rider and schooling Grand Prix. Iris worked to make Tanz comfortable and always with his welfare and happiness in mind, she slowly and carefully brought him back. She worked with his body, doing massage, acupressure and acupuncture along with an exercise program designed to strengthen his body in the right ways, and she worked with his mind to ensure he was happy, enjoying the work and ready to progress. Iris' understanding of horse biomechanics, combined with her expertise in natural equine medicine and amazing riding and training skills were exactly what he needed! Iris' dressage riding and training skills are International Olympic caliber (she has her USDF Gold Medal) and her combination of skills is nearly non-existent in the United States. Cassel Rock is grateful that Iris was at Valhalla Farm and was willing to take Tanzeln on as a project! Tanzeln *Ps*, ridden by Bryana Smith competed at Intermediaire 1 earning scores to 70% for I-1 and 72.7% at I-1 Freestyle. Bryana and Tanz will be completing at the Regional Championship in Wellington in October. Tanzeln *Pb*, ridden by Janina Romkowski and Bryana Smith earned all needed scores for his performance Silver medal by competing PSG and is now Tanzeln *Ps*. Tanzeln *Pb* competed at PSG with Janina Romkowski. Tanzeln *Pb* competed at PSG and 4th level dressage with Iris Eppinger. Ridden by Irish Eppinger, Tanzeln was Third Level Champion, with a score of 73.3% at Third - 3, 66.97% at Third - 1 and 65.897% at Third-3 at Canterbury May Days Qualifier. Ridden by Danielle Vitosh, Tanzeln won or placed well at Third Level Dressage. Ridden by Collette Zimmer, Tanzeln won his Second Level Dressage classes. Ridden by both Kendra Menzies and Eva Oldenbroek, Tanzeln won in Second Level Dressage classes. Completed his ATA performance requirements by completing a novice level cross-country event. Successfully competed in Training Level and 1st level dressage with scores in the high 60's/low 70's. 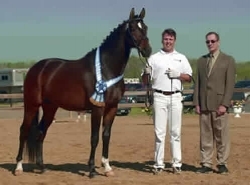 Tanzeln placed 1st in all 3 "colts of 2000" in-hand classes in which he was entered in 2002 with scores as high as 78%. 3rd USDFBC Regional Finals "Weanling through 3 year old Colts"